Did Yusei Kikuchi throw too many strikes in his three-inning outing Saturday — his second start of the spring? SURPRISE, Ariz. — Manager Scott Servais shot down the premise of the question before the reporter could even finish asking it. 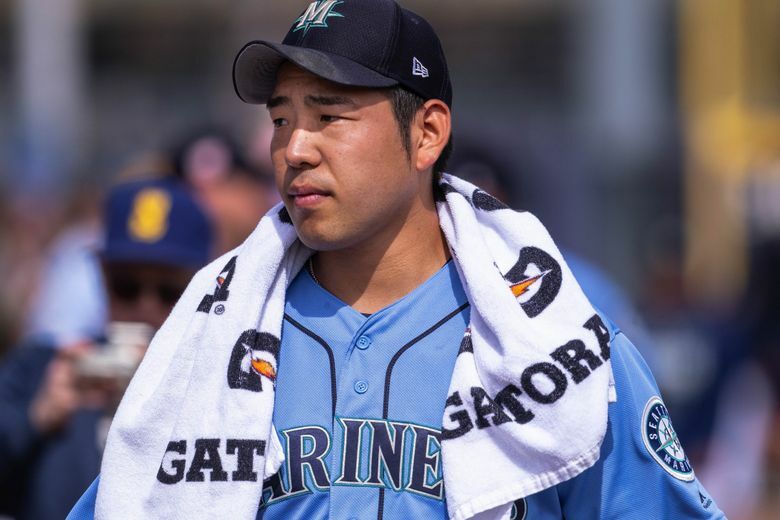 The query centered around the idea of Yusei Kikuchi throwing too many strikes in his three-inning outing Saturday — his second start of the spring. Of the 39 pitches Kikuchi threw against the Kansas City Royals at Surprise Stadium, 30 of them were strikes. He only threw two balls in a count to one of the 12 batters he faced while also tossing 11 first-pitch strikes. Despite all the strikes he threw in his brief outing, Kikuchi didn’t come out of it unscathed. After carving up the first six batters he faced, including three strikeouts, he ran into some trouble in his third and final inning of work. In a sign of what was to follow the rest of the game, the Mariners defense didn’t help out Kikuchi. Brian Goodwin reached on a leadoff one-hop single that shortstop J.P. Crawford should have gloved and converted to an out. Kikuchi then grazed the helmet of Brett Phillips with a wayward fastball to put runners on first and second with no outs. After getting Cam Gallagher to fly out to right, Billy Hamilton put a ground ball just inside the third-base bag and just out of the reach of third baseman Dylan Moore for an RBI double. Moore made a nice play on Whit Merrifield’s hard ground ball to third for an out, but it allowed another run to score on the play. Kikuchi ended the inning by getting Adalberto Mondesi to fly out. Kikuchi allowed the two runs on two hits with the three strikeouts and one hit batter. He lamented his inability to put multiple hitters away after getting up quickly in counts. Servais thought it was pitch selection as much as execution. “Once he got ahead with the fastball, he has such good secondary weapons maybe he could have gone to those a little earlier in the third inning, but he goes right after hitters,” Servais said. Kikuchi wanted the location of his fastball and slider to be more precise to generate swings and misses or even weak contact. It’s the difference between control and command. Kikuchi’s control still had him throwing strikes, but his command didn’t allow him to put the baseball where he wanted. And that fine line between control and command is something that big-league hitters will feast on. This is one part of many adjustments for Kikuchi, who was dominant in Japan’s Nippon Professional Baseball. He knew he’d be facing higher-level hitters. And it will only get more difficult in regular-seasons games. But the Mariners believe Kikuchi is equipped to not only handle it, but flourish over time. “He’s definitely doing everything we hoped he would and continues to get better,” Servais said. As part of the adjustments, Kikuchi modified and shortened his hours-long pregame preparation. Kikuchi was on the field stretching about 55 minutes before first pitch, which is his preferred time. Seattle hopes that will be condensed a little bit. His routine also includes more throwing than typical pitchers. While Royals starter Brad Keller was warming up in the top of the first, Kikuchi was playing catch in the bullpen. In his first start, he played catch with Novak in front of the dugout as he waited for player introductions and the lineup cards to be exchanged. This isn’t typical in MLB, but more common in Japan. The Mariners don’t want to force him into doing the same exact thing as Gonzales or LeBlanc. They want Kikuchi to find a balance between what he’s always done with some precaution based on the heavier workload and longer season in MLB. Kikuchi is far from a diva. He wants to do what is expected and what is best for him and the team.